A number of courts have taken the view that Congress intended the CWA to regulate the release of pollutants that reach “waters of the United States” regardless of whether those pollutants were first discharged into groundwater. We reported on the recent decision from the Ninth Circuit Court of Appeals in Hawaii Wildlife Fund v. City of Maui, which held that that a point source discharge to groundwater of “more than [a] de minimis” amount of pollutants that is “fairly traceable from the point source . . . such that the discharge is the functional equivalent of a discharge into a navigable water” is regulated under the CWA. 881 F.3d 754, 765 (2018). Other courts, EPA notes in its request, have taken the view that “[n]either the Clean Water Act nor the EPA’s definition [of waters of the United States] asserts authority over ground waters, just because these may be hydrologically connected with surface waters.” Village of Oconomowoc Lake v. Dayton Hudson Corp., 24 F.3d 962, 965 (7th Cir. 1994). EPA has not stated that CWA permits are required for pollutant discharges to groundwater in all cases. Rather, EPA’s position has been that pollutants discharged from point sources that reach jurisdictional surface waters via groundwater or other subsurface flow that has a direct hydrologic connection to the jurisdictional water may be subject to CWA permitting requirements. As part of its request, EPA seeks comment by May 21, 2018 on whether it should review and potentially revise its previous positions; specifically, whether it is consistent with the CWA to subject discharges to jurisdictional surface waters via groundwater to CWA permitting. 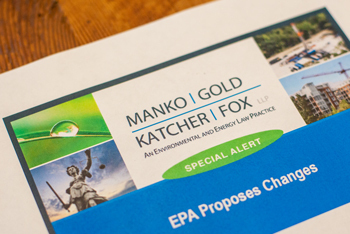 Further, EPA seeks comment on whether some or all of such discharges are addressed adequately through other federal authorities, existing state statutory or regulatory programs or through other existing federal regulations and permit programs. For more information, please contact Jonathan E. Rinde at 484-430-2325 or Zachary J. Koslap at 484-430-2330.